← Get the most out of Facebook insights for small business ? How Hospitality Companies are Using Social Media for Real Results ? Often, we think of our offline lives as distinct from our online presence, but social media is real life. Look no further than the hotels you stay in, the restaurants where you dine, the airlines you fly on and the theme parks you take your family to for proof. More often than not, there’s a Twitter and Facebook account — possibly even a Foursquare presence — behind the venue in question. Because social media is a platform for the customer’s voice — and that voice can be heard by anyone in the world — the hospitality industry as a whole has embraced social media in a huge way. Hospitality businesses of all sizes — from the biggest hotel chain to the little neighborhood cafe — have found their own unique way to harness the power of Facebook and the distribution possibilities made available via Twitter. Customer service is the most obvious way for the hospitality industry to use social media, and Twitter is the perfect vehicle for resolving customer issues or making a guest’s day with a simple “thanks for visiting” tweet. But the best in the business are going above and beyond in the customer service arena. 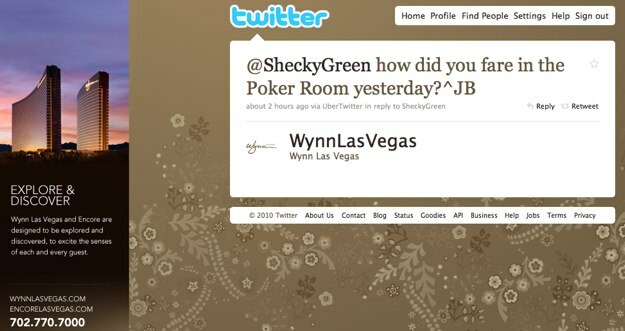 For example, the Wynn Las Vegas and Encore hotels use social media sites like Twitter and Foursquare to improve their customer service efforts and better meet the needs of their guests. As the E-strategy Development Manger for the hotels, Jade Bailey makes sure that her team greets and caters to guests who check in there on Foursquare or tweet about being somewhere on the property, both on social sites and in person. The team has also seeded Foursquare with numerous tips inside the hotel, enlightening guests on the fascinating stories behind some of the more lustrous decorative embellishments. Smaller businesses are going the extra mile as well. CoffeeGroundz — an independent coffee shop in Houston, Texas — uses Twitter as a way to make its customer service more personalized than its bigger competitors. The store’s general manager is credited with making CoffeeGroundz one of the first businesses to take to-go orders via Twitter, an effort that began in October 2008. In addition to to-go orders, the boutique coffee spot now also accepts table and event reservations via direct message on Twitter. At the Roger Smith Hotel in New York, social media has become immersed within the hotel’s unique culture. At its core, the Roger Smith Hotel is about storytelling — with a focus on art and people — and social media has become the way in which the hotel can share these stories and create new ones. It’s this type of open thinking that keeps The Roger Smith at the forefront of the social media curve. Simpson points to an event back in 2009 as a catalyst for some of its creativity. The artsy hotel then hosted a Social Media Breakfast, which led to interest from other social media and web groups, and ultimately inspired Simpson to actively immerse himself in the social media culture. Because The Roger Smith is independent, Simpson found ways to bend the rules for groups and startups, making the hotel inviting to all types of social media event organizers. For Simpson, exposure is key and hosting these events helps get the hotel’s name out there. Today, the hotel is essentially the social media-friendly hotel of New York; events are booked for each night of the week and its become the official hotel of many a New York web conference. The hotel is also being extremely avant garde with its approach to installation art. They’ve commandeered an art studio on Lexington Avenue outside the hotel and turned it into an experimental space where art meets social media. The space is dubbed the RS Pop-Up Shop, or RS POP, and it’s open to up-and-coming designers and artists who want to showcase their work with social media flair. Each selected RS POP participant is heavily supported with social media exposure, so artists and designers are featured both in the art studio and online via the hotel’s social media channels. Disclosure: The Roger Smith Hotel has hosted Mashable events. Mom is a very important person in the hospitality space. She books the hotels, makes travel arrangements and handles most of the money matters. Mom is often the decision maker for the family. As the former Vice President, Public Relations/New Media at Universal Orlando Resort, Cynthia Gordondeveloped The Universal Mom Squad to make Mom’s experience at the park second to none. Gordon is referencing the Walt Disney World Moms Panel — 43 hand-picked moms, and a few dads in the mix — who serve as online advisers and help answer park-related questions on behalf of Walt Disney World. The moms answer submitted questions and the inquisitive can browse through topics, search for answers, submit their own question or learn more about the panel. The program started in 2008 and new moms are added to the group each year. Another hospitality brand catering to moms is the Royal Caribbean International cruise line. The company recently took the opportunity to invite a group of moms participating in the weekly hashtag Twitter event #gno(Girls Night Out) aboard its Oasis of the Seas cruise ship to host one of its Twitter parties while at sea. The moms aboard the ship engaged with other moms the world round, spreading the message that cruise vacations are ideal for fun, family travel — there’s no cooking, cleaning or child care concerns to worry about. As the host, Royal Caribbean was a part of the thousands of tweets generated during the two-hour Twitter party. Often, social media is siloed to an individual department. This situation sets the customer up for failure. Imagine an eager customer — aware of a company’s social media presence — who ventures out in the real-world and encounters employees with zero knowledge of their own company’s Twitter account or Facebook Page. The end result defeats the entire purpose of social media. If social media is on the menu, then everyone from the doorman and the bartender to the CEO should know about it. Those in the know should make it a point to educate staff on their own social media presence and promotions, as well as encourage employees to embrace social technologies for their own personal use. Simpson says this is what helps set the Roger Smith Hotel apart from its bigger competitors. He works with his social media partner Adam Wallace to maintain the Roger Smith accounts, but the two of them have also prioritized educating the hotel’s 100+ member staff. Together, they’ve inspired nearly a quarter of the team to take up tweeting by teaching them that it’s just about conversation. As such, one of the hotel’s bartenders has developed his own following on Twitter. Simpson says that often the bartender will tweet while working his shift and even offer to pick up a drink for the first few patrons who stop by. In connecting the dots between social media, management and staff, the hotel can ensure that guests’ expectations are superseded, and not deflated, when they walk in the door. Posted on 2011, January 21, in Tools, Twitter and tagged Tools, Twitter. Bookmark the permalink. Comments Off on How Hospitality Companies are Using Social Media for Real Results ?.